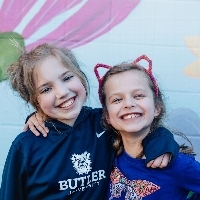 Atlanta Academy students, Emme Pennington (4th grade; age 10) and Maddie Royster (2nd grade; age 8), are living with Juvenile Arthritis (JA) and have been since the ages of 4 and 18 months, respectively. This year, Emme and Maddie have teamed up to bring awareness to Juvenile Arthritis (JA) and the Walk to Cure Arthritis. Everyone knows someone with arthritis. It affects more than 50 million Americans, including 300,000 children. People with arthritis are warriors - they face relentless pain, a frustrating search for a diagnosis, multiple doctor’s visits and treatment, missed work and school, limited mobility, a maze of medical and insurance paperwork, and the desire to live a full life without the limitations that arthritis creates. Our Walk to Cure Arthritis team is committed to finding a cure and helping those affected live life to the fullest. Join our team and raise funds to conquer arthritis and make a life-changing difference, all while having A TON OF FUN! The event features a three-mile and one-mile course, with arthritis information and activities for the entire family. Pet owners are encouraged to bring their dogs. The Walk to Cure Arthritis is the largest gathering of the arthritis community in the world, raising funds for research, resources, better treatments, and a cure. I have joined the movement to improve the lives of arthritis warriors, will you be the ONE to step up and help me? Whether you’re an arthritis warrior yourself or care about someone who is, sign up and WALK to CURE Arthritis. If you can’t join the team, we’d appreciate your donation to help reach our fundraising goal.